1. What is Aloe Juice? 6. Where do I find Aloe? Stress can be caused by water change, thermal shock, toxicity, lack of oxygen (hypoxia) or even behavioral stress. It plays havoc in fish and affects their immune system. Try this alternative home remedy of Aloe Juice to minimise goldfish ailments & diseases. Did you know 15% of all Americans own goldfish? No matter where you go you see beautiful hues of this fabulous fish. However it’s inevitable that they will get sick just like we get ill. Goldfish suffer stress that compromises their wellbeing. Aloe is a popular medicinal plant with many health benefits. It treats both internal and external diseases. Aloe juice contains vitamins A, B, C and E. Some people choose to supplement their diets with aloe juice or multivitamin complexes to maintain optimal health. It’s a completely natural source of vitamins. The aloe in the juice contains more than 20 different minerals, fatty acids, amino acids, lignin, saponins and salicylic tissue. It can cure ulcers, aid digestion and greatly improve the overall immune system. The foundation of good health is ensuring good diet and nutrition. 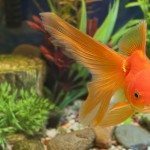 Goldfish stress can be reduced with an aloe tonic and an aloe bath. An aloe bath will give your fish much needed relief. Lack of appetite in your goldfish means decreased food intake. Decreased food consumption will surely attract diseases and ailments. Use of aloe juice will increase their appetite naturally. Using 1 tablespoon of aloe juice per 10 gallons of water, mix your aloe in with fresh, treated water with each water change. Remember to add freshwater gradually. Source a container that’s contaminant free. Fill the container with your primary aquarium or pond water. Premix 1 ounce per gallon of water. You’ll need to bath your fish for about 5 minutes. Give them a bath twice daily until they start to get better. The aloe bath water can be refrigerated and used again. Aloe juice can be administered orally to your goldfish by using a syringe or an eye dropper. For external use, 1/4 of a drop is placed on each inch of your goldfish body. To pass aloe juice health benefits to their internal organs, you should add 1 tablespoon of aloe juice to a gel fish food recipe. Where do I find Aloe juice? It can be sourced online here. Alternatively you can buy an aloe plant and extract the juice from its succulent leaves. Aloe juice is an all natural choice. It’s easy to administer to your goldfish. It’s relatively inexpensive and is a proven home remedy for curing some ailments affecting your goldfish. It can be trusted to deal with health problems whose signs and symptoms are yet to be diagnosed.